Walk with confidence in overspray or spill areas thanks to our FineFiber Pads and Rolls. This mat grips the floor with top and bottom layers of FineFiber. 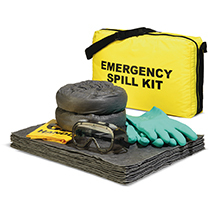 A middle layer of MeltBlown polypropylene ensures high absorbency for even your toughest spills. 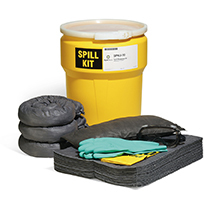 Absorb drips from leaking pumps and help keep drum storage areas looking good. Pre-cut bung holes make for easy access to drum. Pads can be removed and replaced with pumps and valves installed. Made from top-quality FineFiber Mat. Color-coding helps you visually identify the right sorbent for your needs. Blue designates Oil-Only sorbency for oil and other petroleum-based fluids — but not water; fits into many professional surroundings.